HP ENVY x2 with Qualcomm Snapdragon 835 processor announced, Windows detachable with world's longest battery life. HP Inc. today unveiled the ENVY x2, an Always Connected PC that combines the best of a smartphone experience with the best of a Windows PC. The HP ENVY x2 offers lightning fast 4G LTE and Wi-Fi and features the world's longest battery life in a Windows detachable. The HP ENVY x2 features a 12.3-inch diagonal touch WUXGA+ display with Corning Gorilla Glass 4 for increased durability and scratch resistance when on the go. The fan-less CNC Machined Aluminum tablet is 6.9 mm thin and weighs 1.54 lbs. It comes with a 13MP rear camera and also has a 5MP front camera. It is equipped with 1 USB Type-C, micro SD slot, SIM card slot and combo audio jack. Qualcomm Snapdragon X16 LTE modem on the ENVY x2 supports 4G LTE-Advanced with ultra-fast downlink speeds allows for blazing fast connections. Users will also have the performance to do more with the speedy and power efficient Qualcomm Snapdragon 835 Mobile PC platform, multi-task with up to 8 GB LPDDR4X PoP memory, and store movies and pictures with up to 256 GB of storage. 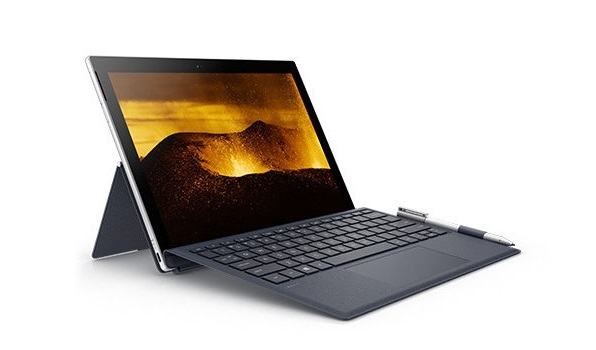 The ENVY x2 is wrapped in a sophisticated leather-like textured case in Oxford Blue and integrates a 110 to 150-degree adjustable stand to transform the device into laptop mode for comfortable viewing. The backlit keyboard has a 1.3 mm key travel for a smooth typing experience in any lighting condition. Easily switch to tablet mode to view videos and unleash creativity with the Windows Ink pen for a natural drawing and writing experience with simultaneous pen and touch. Windows 10 S provides reliable access to familiar and verified applications like Microsoft Office and Microsoft Edge while on the go. Users get added security benefits to protect against phishing and malicious software. Users will also have a one-time option to switch to Windows 10 Pro to access the full ecosystem of Windows applications. HP's ENVY x2 comes with battery life up to 20 hours and get up to 700 hours in Connected Modern Standby with the power efficient Qualcomm Snapdragon 835 architecture to be always on and in sync for instant-on access. HP ENVY x2 will be available is Spring 2018. Pricing and mobile carriers will be disclosed closer to product availability.